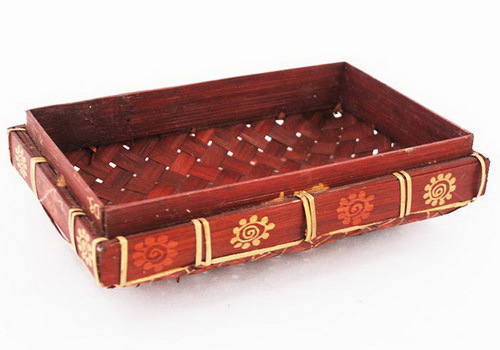 Tinuku ~ Sanggar Peni based in Yogyakarta showcase handicrafts from bamboo trays decorated with batik. 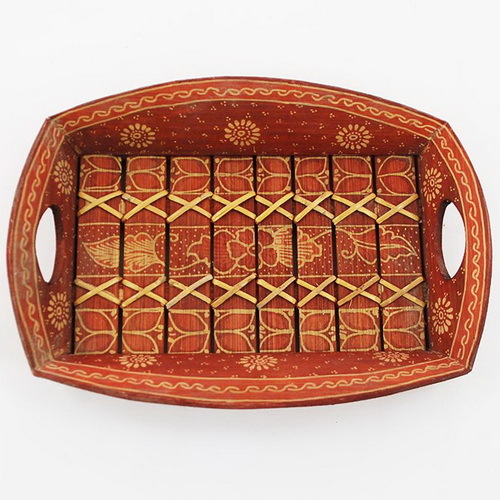 Studio Peni designed the bamboo tray to takes the place of plates, glasses and bowls to serve drinks or food has beautiful batik patterns. Sanggar Peni in Dusun Krebet, Sendangsari Village, Panjangan, Bantul, Yogyakarta, extend the range of literature on batik traditional are generally implemented on fabrics media by placing bamboo and wood as the main media as art works. 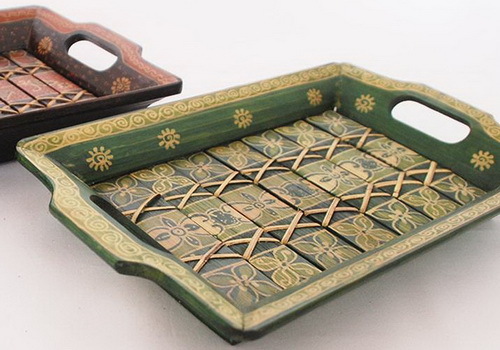 Studio also change tray made from bamboo which is generally plain becomes more artfully by adding graphic decoration in applying the technique of batik art. 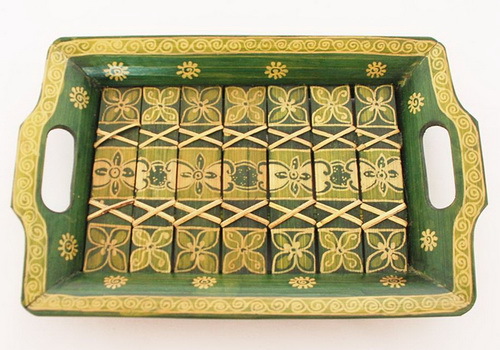 Artistic decorating touches making the tray look beautiful and ethnic stylish uses unusual approach. Batik typically etched on fabric, but the studio developing new traditions using bamboo and wood as raw material batik media. Wooden masks, miniature sculptures of animals and other trinkets decoration painting batik patterned by the same process as batik on cloth. The tray has rectangular and rounded corners sharply characterizes with two holes ergonomic grip. 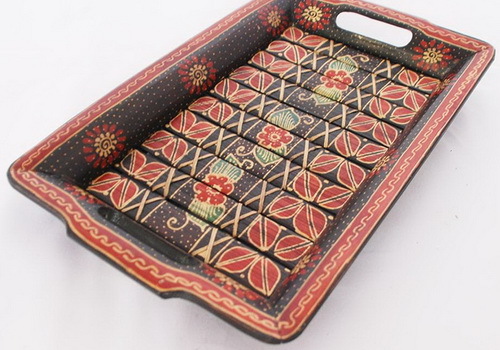 Batik touch on trays unique look that provides traditional atmosphere although not incised sogan color. Form of batik on bamboo and wood shades of flora and fauna present for aesthetic purposes explored foliage from as artocarpus camansi, hibiscus, mango and roses. While fauna motifs usually depict fish, turtles, ducks, frogs, chickens, birds, cats, rhinos, elephants, birds and snakes. Design to order or inspire the designers of natural environment. 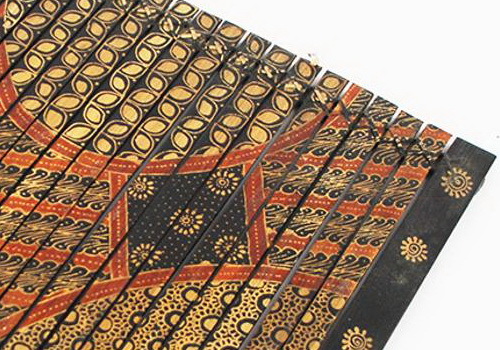 On wooden batik process is similar to batik on cloth. Peni studio using variety of materials with different results. The wood is often used as base material is soft wood such as sengon, pule, mahogany and bamboo to produce the most beautiful colors. 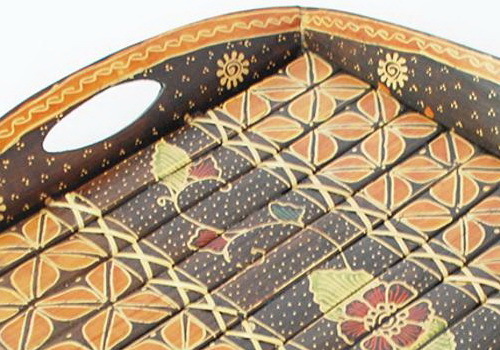 Bamboo batik using standard methods with traditional tools to produce works of naturalist and very distinctive. 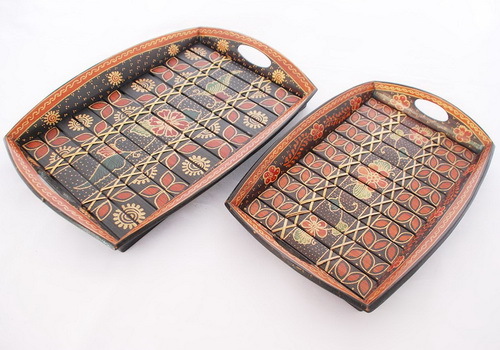 Craftsmen more implementing major design on wooden media are Jlereng, Kawang and Kembang as the characteristics of the typical pattern of Yogyakarta. Process design on the bamboo raw material using pencil as first stage concept delineation. Then proceed to the stage of the batik process using wax. In its application, the wax attached to bamboo urface prior to the coloring process. 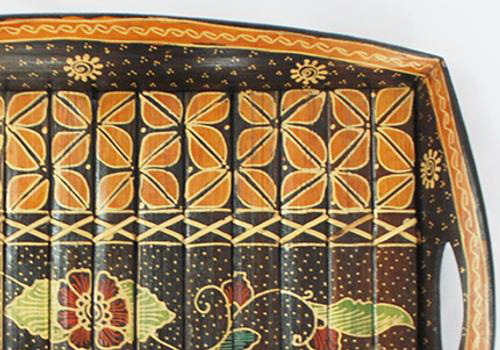 Bamboo and wooden batik is impressive history in the literature on the contribution of batik and one development of batik art works. 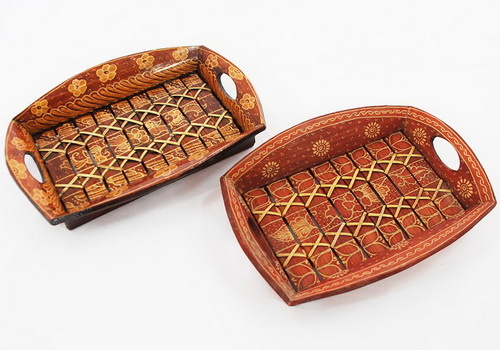 Bamboo and wood craft serves as passive aesthetic elements have the beauty of batik which appears as active aesthetics. The designs created by the studio itself or orders from customers. Studio openness in accepting criticism, suggestions and designs the consumers, so as to hone the creativity and skill of the craftsmen through experimentation and innovation creates new forms.